Love You....and won't you Be Mine? It's been tough getting back into the groove after the holidays, but I'm getting there. During my holiday down-time, I did manage to get organized and now there is a whole slew of new beaded jewelry to get pictured for the website...so stay tuned. Is it just me or do you love Valentine's Day too? Yeah, yeah, it is all commercial -but for us romantics....it's a day to celebrate love and all the specialness that comes with being in love (and well, I think I speak for most ladies when I say, some sparklies don't hurt either!). Remember too those fun little candy conversation hearts we gave in our grade school Valentine's celebrations? It was so fun to read the messages and the colorful hearts were pretty tasty too. So, with Valentine's Day just around the corner, now is the perfect time to start thinking about your sweethearts' gift. If you are longing to say, I "Love You" but want it to be memorable, give your sweetheart the Love You Heart Charm Crystal Pearl Bracelet Set (BES5). This unique one-of-a-kind design incorporates a woman's desire for a more sophisticated piece of jewelry that sparkles, in a classic pearl and crystal bracelet with a playful conversation heart that reads, "Love You". Not quite at that point in your relationship? Or simply have a special friend you wish to express how you feel? 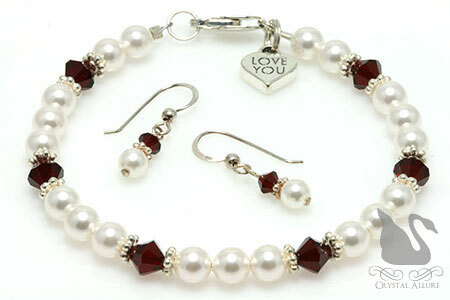 How about the Be Mine Heart Charm Crystal Pearl Bracelet Set (BES4). This unique one-of-a-kind beaded bracelet is similar to the "Love You" style except it showcases a pink crystal instead of a red crystal. With both bracelets you get a matching pair of sterling silver, pearl and crystal earrings. No matter which you choose, you can't go wrong. Not only do you express your love, and give a sparkling gift, you also give her something to treasure for years to come. But hurry, to ensure your sweethearts' gift arrives in time for Valentine's Day, you'll need to place your order no later than February 8, 2010. As my gift to you, from now until February 8, 2010 you can save 10% on either bracelet set and you'll receive a delicious chocolate truffle in your shipment. No coupons needed. Hey Stephanie...lovely sets...I just love pearls and crystals anytime of the year!!! How is your sinus infection...those things can linger!!! Hope you enjoyed New Years regardless of what you did! Thanks for asking how I feel Heather. I'm doing okay. I'm actually on the last day of antibiotics but called the doc since it doesn't quite feel cleared up yet. We did still visit friends for New Years...just didn't stay long. Hope you had a fabulous New Year! 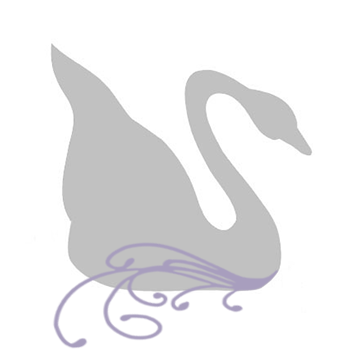 Much happiness, health and prosperity to you as well!